Best Days: Most days should have small peaky waves with periods of favourable winds, though there'll be tricky periods as per usual. I like the look of the Friday and Sunday mornings the best, and the S/SE groundswell for Sunday looks very interesting too. Recap: A new S’ly groundswell built across Sydney beaches on Tuesday, offering inconsistent but straight and well defined 2-3ft surf at Sydney’s south facing beaches and 3ft+ surf across the Hunter (though much smaller elsewhere not exposed to the south). 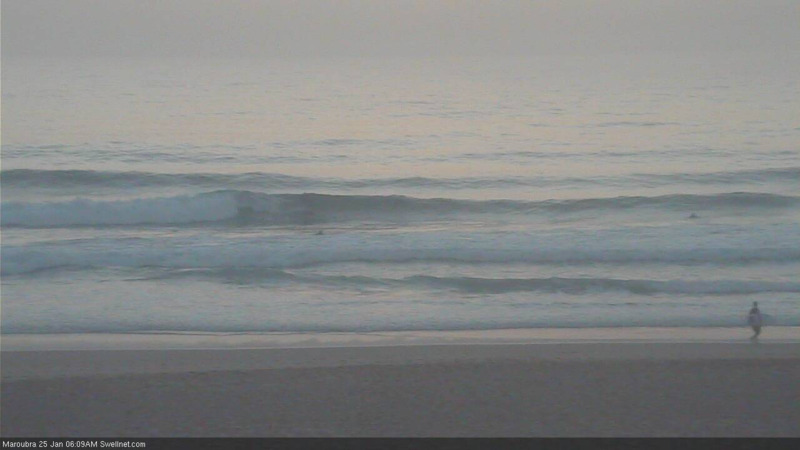 Size eased slowly into today but we’ve also seen a small peaky NE swell in the mix up to 1-2ft. Early light winds on Tuesday freshened from the north into the afternoon, whilst light morning winds today swung gusty S’ly around lunchtime with the passage of a trough. We should see some fun small waves over the coming days. Today’s southerly change didn’t have much fetch trailing behind, but it was associated with a broad front that pushed through the lower Tasman Sea, generating a southerly swell that’ll slowly build 2-3ft sets at south facing beaches into Thursday, holding through Friday. The sets will be inconsistent, and there is likely to be a slight lag on wave heights early Thursday. Surf size will be smaller from this source at beaches not open to the south. Further low pressure activity much further south (below New Zealand) is generating small secondary southerly energy that’ll fill in the mix, though no great size or strength is expected from it. Lastly, today’s trough will stall just to the north of our region into Thursday and a small but reasonable E/SE fetch between it and a small high pressure ridge extending east from Tasmania will generate peaky E/SE swells from late Thursday and into Friday. We’ll see the most size from this source across the South Coast (3ft+) but the Sydney, Hunter and Illawarra coasts should see occasional 2ft, maybe 2-3ft sets at times as well. As for conditions, most of Thursday should see light variable winds but model guidance is lingering a moderate S’ly airstream north from Cronulla through to Newcastle in the morning, which (in addition to overnight southerlies) may create bumpy conditions at exposed beaches. However, some locations in this area (mainly the Northern Beaches) should see terrestrial influences overcoming the synoptic flow, so there’s a reasonable chance for pockets of favourably light SW winds. By Friday, we’ll see light variable winds everywhere and very clean conditions, ahead of freshening NE winds into the afternoon and a gradual deterioration in wave quality. So, don’t get your expectations too high - but there’ll be small peaky beachies to finish off the working week. Friday’s NE winds will kick up some peaky local windswell for Saturday. Local winds however look tricky, thanks to the passage of a complex though ultimately weak trough to the south. This trough will temporarily disrupt the N/NE airstream - leading to a period of light variable winds - though we will be at risk of redeveloping NE breezes (mainly in the a’noon). On the balance I think we’ll do pretty well though, with size holding somewhere in the 2-3ft range out of the NE (Friday’s S’ly and E/SE swells will be on the way out). Sunday looks equally complex in the local wind department thanks to the presence of the trough to the south, but again, on the balance it’s looking pretty good at this stage with mainly light winds and sea breezes. There’s a risk of a shallow S’ly change in the south too. 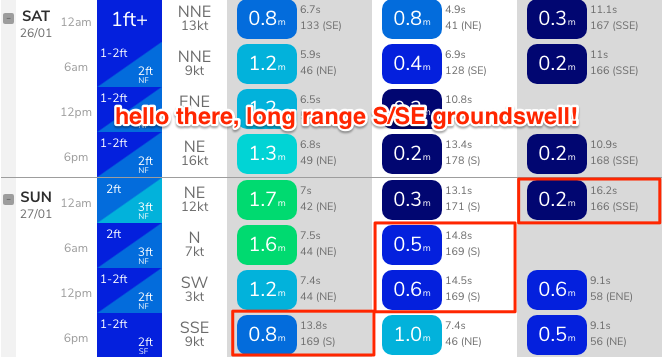 As for surf, we should see persistent NE windswell maintaining 2-3ft sets at most open beaches, but also in the mix will be a small long period S/SE groundswell generated by an intense polar low off the ice shelf well south of New Zealand. Satellite images have confirmed 50kt+ winds at its core in the last twenty four hours, aimed nicely into our swell window (though a long way from the mainland), so we can now be a little more confident on its arrival. Model guidance is holding steady with its estimates (from Monday, see below), though it’s shunted back the timing a few hours, which points to a Sunday afternoon peak. At this stage I think we’ll see inconsistent 3ft+ sets at a bunch of reliable south swell magnets. Let’s fine tune the wind outlook in Friday’s notes to see if the shallow southerly change will be broadened in coverage as the models update. Still nothing amazing to get excited about. Early next week looks like being dominated by northerly winds across the coastal margin, and a combination of local NE windswell and easing S/SE groundswell from Sunday. There are no major swell sources on the horizon, but it does appears that the trades are about to reactivate through the northern Tasman and lower Coral Sea early in the week, which suggests a spell of trade swells mid-late next week and beyond. More on this in Friday’s update. to be miserable like the rest of the east coast. Owell I just live on the memories. It's all about perspective evo. I've surfed everyday this year and each one has been "the best surf I've had that day". Sure some mornings it took real creativity in craft selection and location to even catch a wave but was strangely rewarded with stunning sunrises and sunsets I would have otherwise missed. Ps luck bigger ha ha where have you been ? There was a couple o’ fun north east wind swells at the start of the month..... heaps of sand on the beaches.... just need a strong swell to pull some sand out the back and could be epic late summer through winter.... who knows ah? Got to stay positive. come on guys lets be honest Sydney surf for 2018 was the worst on record ever and that's just not by my standards that's the conclusion from all northern beaches locals in the 50 age bracket. and yes now we have the worst summer surf for a month no wonder we are all going overseas to surf. Oh well you never know 2019 could be our best year ever. "lets be honest Sydney surf for 2018 was the worst on record ever and that's just not by my standards that's the conclusion from all northern beaches locals in the 50 age bracket." Not doubting that the surf hasn't been amazing over the last month or two, but again, through the lens of Stu's article (below) - are you sure there was never previously a summer as bad in the last forty years? I remember the year of 'The Void' although cannot recall which year it was, they all blend in after a few decades. Late 90's there was a summer with nothing over two feet for a full three months. I was surfing 'Summers' at Tama on an old McCoy Coolite for the period, and am sure there were weeks when no-one else in Sydney was getting waves at all. Mates were astounded that I was claiming to have surfed at all ... also that I will froth over anything, even a 1ft Coolite novelty session. The point being that that year was much worse than this summer. Haha yes, well besides the last week and a half, Manly hadn't dropped below 2-3ft for three or so weeks. "Plenty of small peaky options for exposed beaches!" Dawn's Patrol tail riders are busy jacking up the swell. White pointers were spotted just off the shore. Some nice bottom turns amongst the shapely peaks. Beach Bum's backdoor slots have opened up along the whole beach. Surfs Up!